TSPSC Agriculture Officers Recruitment Results/ TSPSC AOs final Selection list 2017: AO Posts, How to apply,Hall Tickets,Results; TSPSC has given the Agriculture Officer Posts 2015 recruitment notification and applications are invited Online from qualified candidates through the proforma Application to be made available on Commission’s WEBSITE (www.tspsc.gov.in) to the post of Horticulture Officer under the Department of Agriculture and Cooperation. Applicants must posses a Degree of Bachelor of Science in Agriculture of a recognized University in the State or any other University recognized by Indian Council of Agricultural Research. Fee: (Remittance of Fee) Each applicant must pay Rs. 100/- (RUPEES ONE HUNDRED ONLY) towards Online Application Processing Fee. This apart, the applicants have to pay RS.120/- (RUPEES ONE HUNDRED AND TWENTY ONLY) towards Examination Fee. However, the following category of candidates are exempted from payment of Examination fee. 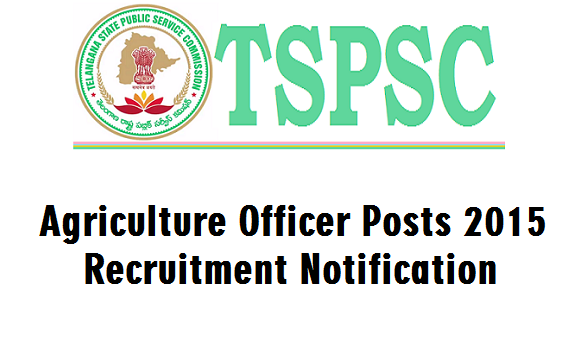 Before applying for the posts, candidates shall register themselves as per the One Time Registration (OTR) through the Official Website for TSPSC. Those who have registered in OTR already, shall apply by login to their profile using their TSPSC ID and Date of Birth as provided in OTR. The candidates who possess requisite qualification may apply online by satisfying themselves about the terms and conditions of this recruitment. 17/10/2015 and Oral Test (Interview) held on 06/02/2017, 07/02/2017 & 16/03/2017 at TSPSC Office, Hyderabad and cancellation of provisional selection Dt: 20/03/2017 due to technical problem in the software for Direct Recruitment (General) to the post of Agriculture Officer under the Department of Agriculture and Cooperation, Telangana State, the following Registered Numbers have been provisionally selected for appointment to the post of Agriculture Officer vide Commission’s Notification No.11/2015, Dt: 05/09/2015, the selections have been reverified after computing results of revised final key and published here-with subject to the following conditions.